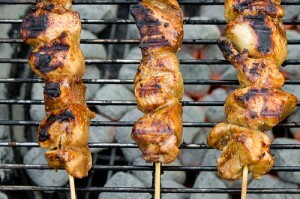 Chicken Bar B Q recipe by Maher at DesiRecipes.com. Chicken Cubes marinated in tandoori masala and then bar b q on grill. Take in bowl, the olive oil, with yogurt, salt , tandoori masala, garlic , and mix well. Pour this mixture on the chicken pieces. Skew on seekhs and on to the Bar B Q. Let each side cook for Ten minutes. Its ready to eat with roti. if we do not have sekhs...then what we do? I Need Lahori Chana Special recipe.